Chefs travel, to recharge, get new ideas, get inspired, and the inspirations will be translated to the dishes in front of you. The same goes for The Soup Spoon, where SouperChef Anna creates soup recipes inspired from her travel experiences around the world. From now till 1st of September, get a taste of Brazil with a slurp of their Souper Chef Specials - Brazil Souper Inspiration. This is the second launch, if you didn't manage to taste the first. With options of 2 meats, 1 seafood and 1 meatless, I'm sure you will find one that will suit your palate. Black beans, tomatoes, sweet potatoes, yam, tapioca, chayote, celery, carrots, garlic, onions, coriander, chillies, paprika, cumin, oranges and mango juice. Beans and rice are at the heart of Brazilian food, followed by manioc (a root vegetable like a potato). feijoada, a thick and heavy stew of black beans and pieces of pork and other meats, is their national dish. 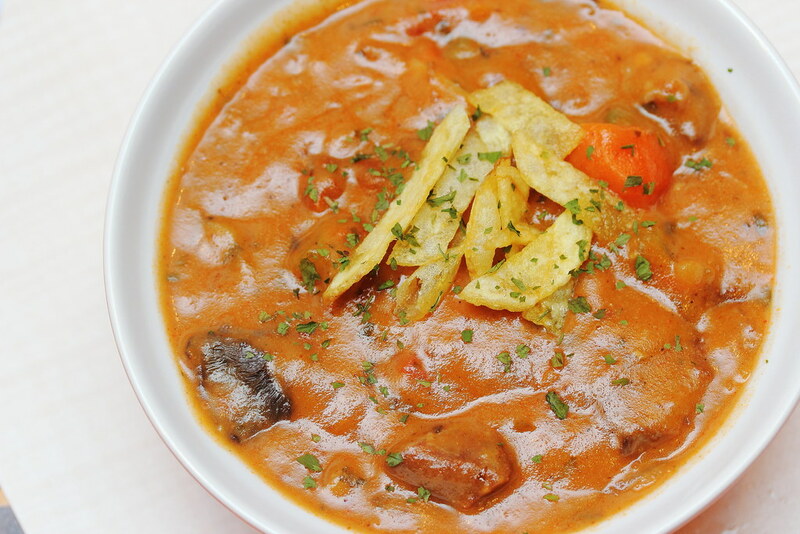 Caldinho de feijão is a lighter version which SouperChef Anna had tried in Recife. 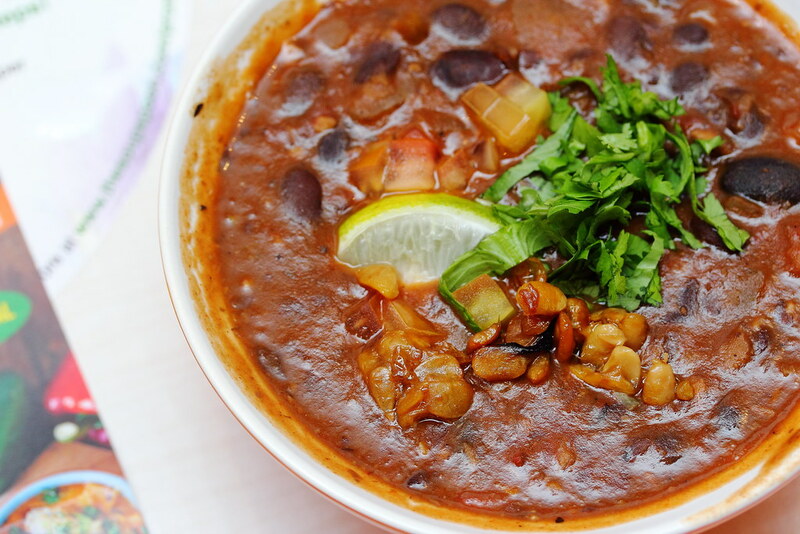 At The Soup Spoon, she created a meatless version, Vegan Caldinho de Feijão replacing meats with roots such as sweet potatoes, yam and tapioca. 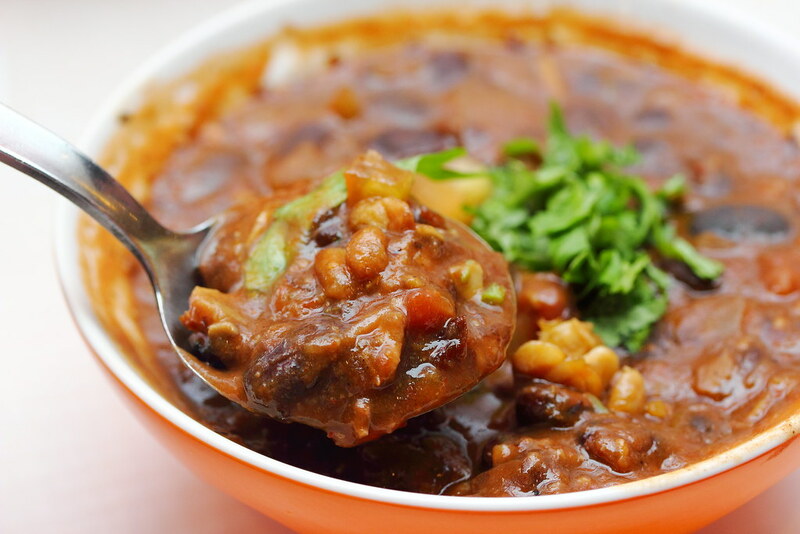 Spiked with diced tempeh, that gave a fun, chewy texture to the mashy beans and soft roots. Don't overlook the small wedge of lime served atop, which brightens up the stew with a zesty citrus note. Marinated NZ grass-fed beef cubes, carrots, potatoes, onions, garlic, tomatoes, button mushrooms, artichoke hearts, red rice, paprika, capers, celery, cream, herbs and spices. Little did I know that Beef Stroganoff is a Russian dish. First introduced to the Brazilians in the 50s, the original recipe has evolved to include much more ingredients such as tomatoes, ketchup, Worcestershire sauce, heavy cream. The Soup Spoon's version is a hybrid of both. Using marinated NZ grass-fed beef cubes, the meat was really tender, and my favourite part of this soup is definitely the chunks of button mushrooms along with other vegetables cubes. It wasn't too creamy, and I like the tang that edged the soup, lent by the piquant capers. The thin fried potato sticks atop reflects Chef Anna's attention to details, in which the Brazilian Beef Stroganoff is traditionally served with rice and chips. Kühlbarra barramundi fish, red bell peppers, green bell peppers, tomatoes, tapioca, chillies, coriander, onions, garlic, ginger, coconut cream, kaffir lime leaves, paprika and lemons. Bazilian fish stew comes in 2 styles - Baiana and Capixaba. Baiana style is heavier with coconut cream and African red palm oil while the latter is lighter without both. 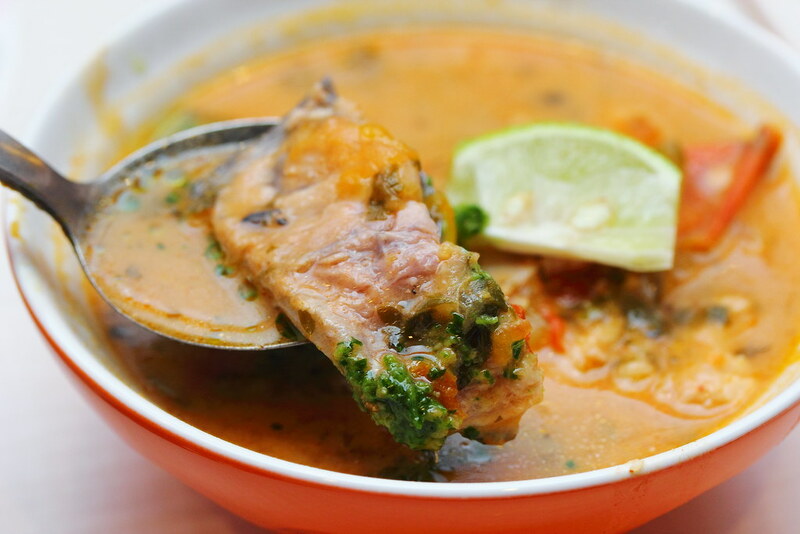 Moqueca Barramundi is a mixture of two, with a little coconut cream but no palm oil added. When I first tasted the Kühlbarra barramundi fish, I mistook it as salmon as I felt both share similar richness in taste and texture. It was sweeter and tender than I had expected from a stewed fish. The soup itself is like an in-between of laksa and red Tom Yam soup. As a meal, I would very much prefer a clear soup, just as I would take my tom yam soup. Marinated chicken thigh, carrots, tapioca, yam, tomatoes, onions, garlic, pineapple, okra, quinoa, turmeric, ginger, coriander, coconut cream, oranges, lemons, herbs and spices. Galinha Caipira is one of Brazilian's comfort food, which Chef Anna had it in Minas Gerais style. I learnt that in Brazil, it is over in Minas that one tastes the essence of home-cooked food. Embedded within is a strong Portuguese influence, hence thick broths and stews are much celebrated here. 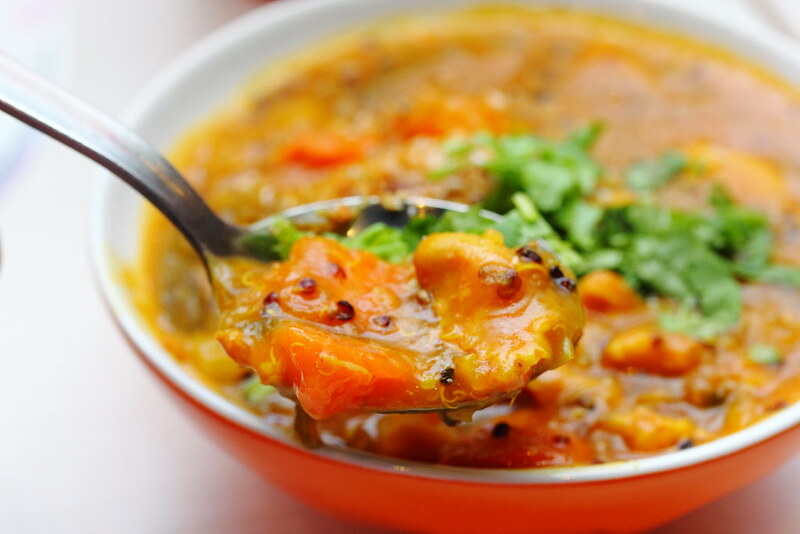 Bright orangy yellow in colour, turmeric dictates the robust character of the stew. The quinoa absorbed the wonderful juices from the roots and vegetables, thickening the stew into congee. The presence of tomato and pineapple reminded me of what my mum usually does to enliven the taste of her curry. Garnished with roasted chopped peanuts, coriander leaf and coconut flakes, the intensified nutty and coconuty flavours bespeaks Chef's Southeast Asian roots in a subtle but punchy manner. From tasting these 4 Brazil Souper Inspiration, I get a glimpse of the Brazilian cuisine. I heard this is a much toned-down version - going easier on the cream, relying on roots and vegetables to create the texture and heartiness. 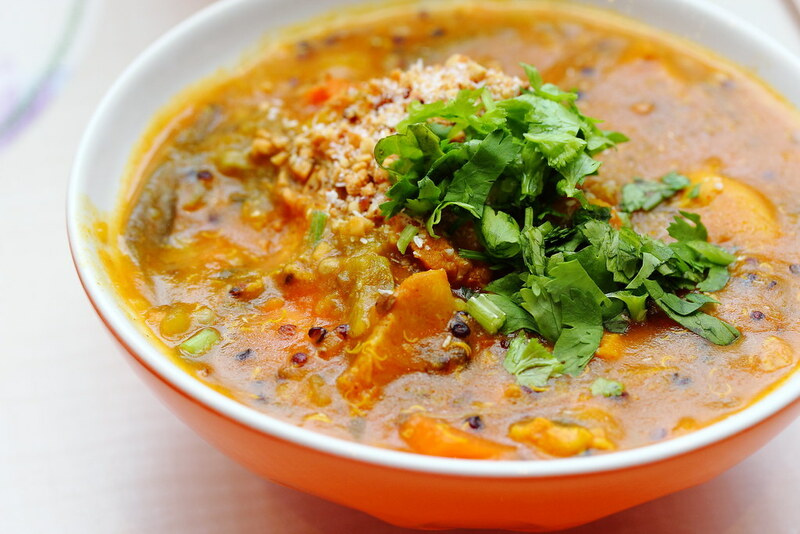 What's notable is the use of herbs, spices and zest, which tickle my tastebuds in all 4 soups. Behind each inspiration is an interesting encounter, and you may read each story from their E-magazine which can be downloaded on their website. Do make an effort to read, and you may then find a deeper meaning in every slurp.